Pius Heinz is the 2011 World Series of Poker main event Champion. The deserving 22 year old German poker pro outlasted 6,864 other players on his way to winning pokers most coveted prize – the gold and diamond WSOP bracelet and $8,715,638 in prize money. The aggressive and intelligent play of Pius Heinz led the new champion to ultimate victory after a grueling 3 hour head to head match with runner up Martin Staszko, a very capable Czech Chess Expert. The chip count lead changed back and forth multiple times but in hand 301, Pius Heinz won pokers biggest prize – the 2011 WSOP Main Event Championship. 2011 Poker Player of the Year, Ben Lamb finished third and a well played fourth prize went to Matt Giannetti. Well played. 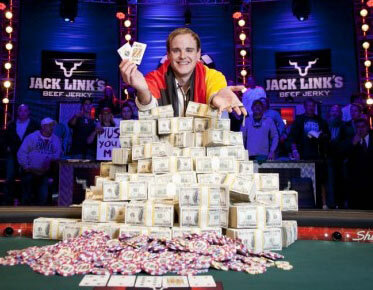 Congratulations to the first German WSOP Main Event Champion and new King of Poker, Pius Heinz. 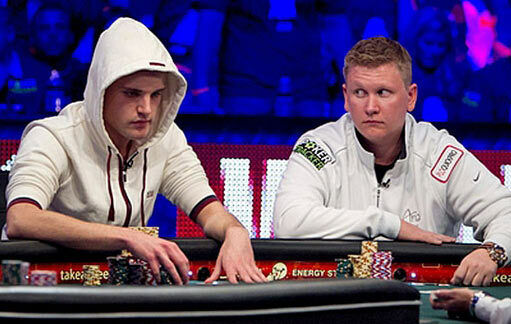 Continuing coverage of the WSOP 2011 main event final table after dinner on Sunday night. The dream is alive for just the final 4 players. Only 3 will play on Tuesday night for the $8,715,638 Championship and the most coveted bracelet in all of Poker. Pius Heinz from Cologne, Germany has taken the final table by storm. Ben Lamb has had an amazing year. Matt Giannetti has worked his way up to 2nd place. Martin Staszko has fallen from chip leader to short stack. 6,865 players entered the 2011 World Series of Poker Main Event. Only the November Nine remain alive for the champions $8,715,638 first place prize .